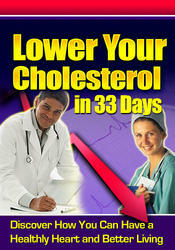 (ADMA), the levels of which are increased during hypercholesterolemia. The elevated ADMA levels likely result from the diminished activity of dimethylarginine dimet-hylaminohydrolase (DDAH), which normally degrades ADMA, that accompanies hypercholesterolemia. 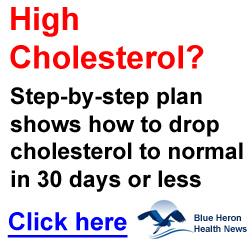 Furthermore, the NOS enzyme cofactor tetrahydrobiopterin (BH4) is also reduced during hypercholesterolemia, which would further reduce the bioavailability of NO. 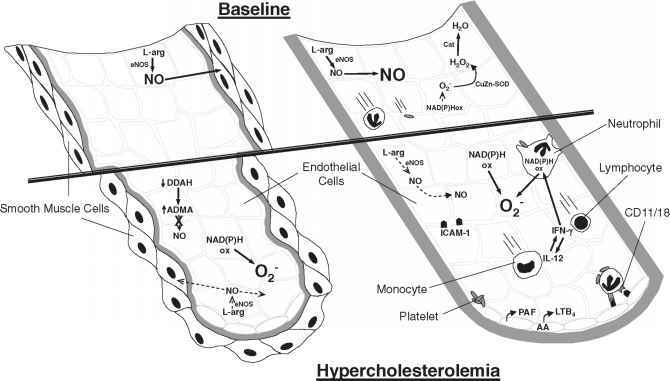 The net effect of these changes in both animal and human subjects during hypercholesterolemia is a diminished capacity for arteriolar endothelium to produce NO and to mediate endothelium-dependent vasorelaxation. It is important to note that these vessels are capable of responding to direct stimulation of the smooth muscle cells by NO donors, supporting the concept that there is a loss of NO bioavailability rather than a deterioration of smooth muscle cell responses to NO. However, the response of denuded coronary arterioles to vasoconstrictors is reduced in hypercholesterolemic humans, compared to their normocholesterolemic counterparts, suggesting that smooth muscle-dependent alterations do occur in this condition, albeit via an NO-independent mechanism. Figure 1 Inflammatory alterations in arterioles (left) and venules (right) elicited by hypercholesterolemia. Under baseline conditions (top portion of vessels), the basal release of nitric oxide (NO) maintains arteriolar smooth muscle tone and prevents cell-cell interactions in venules. Antioxidants such as cata-lase and CuZn-SOD minimize the levels of proinflammatory oxidants. During hypercholesterolemia (lower portions of vessels), NO bioavailability is reduced and oxidant production is enhanced. This promotes smooth muscle contraction (constriction) in arterioles. In the venular segment of the microcirculation, a proinflammatory and prothrombogenic phenotype is assumed. Adhesion molecule expression is increased resulting in the recruitment of platelets and leukocytes. The adhesion response is induced by lipid mediators and cytokines. L-arg, L-Arginine; eNOS, endothelial nitric oxide synthase; O2-, superoxide; cat, catalase; H2O2, hydrogen peroxide; SOD, superoxide dismutase; DDAH, dimethylarginine dimethylaminohydrolase; ADMA, asymmetric dimethylarginine; ICAM-1, intercellular adhesion molecule-1; IL-12, interleukin-12; IFN-g, interferon-g; AA, arachidonic acid; PAF, platelet-activating factor; LTB4, leukotriene B4; NAD(P)H ox, NAD(P)H oxidase. the impaired endothelium-dependent vasodilation exhibited by arterioles during hypercholesterolemia. Unlike in venules and atherosclerosis-prone large arteries, there is little evidence for the accumulation of adherent leukocytes or platelets in arterioles in animal models of diet-induced hypercholesterolemia. However, there is some evidence that oxidized low-density lipoprotein (oxLDL), which is elevated in blood of hypercholesterolemic humans, can induce the rolling and firm adhesion of leukocytes in arterioles. The leukocyte rolling response is mediated by P-selectin, while the firm adhesion of leukocytes is supported by b2-integrins.